DIRECTIONS: Located on a knoll behind a house at the intersection of Crowfoot Road and Ensign Pond Road. This cemetery was originally transcribed in October 1973 and is part of the Eleanor Hall Files at the Moriah Historical Society. Information in red indicates discrepancies found in a separate undated transcription. It was updated and verified by Greg Furness in May of 2011. All linked photographs are copyright G. Furness. 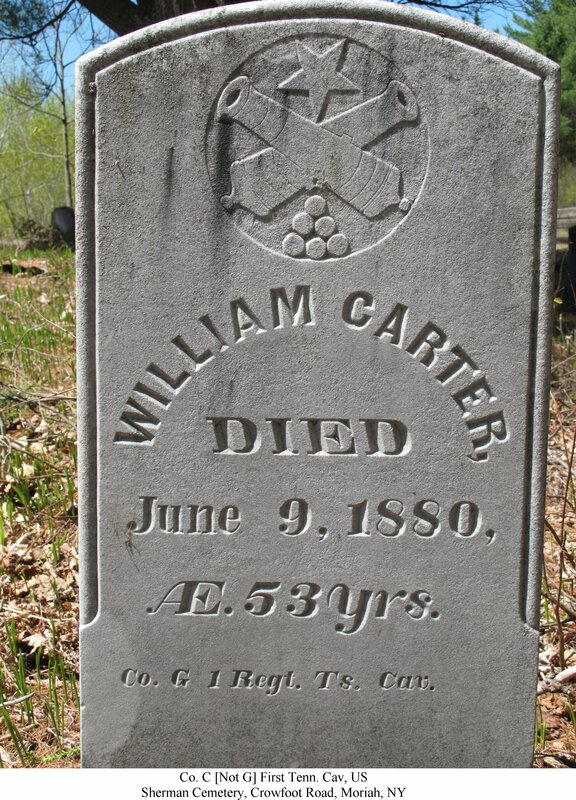 This cemetery is located on private property, and permission should be obtained before visiting. Click here to see a map to the cemetery. Philo A. d. Nov. 19, 1861 Æ 37 yrs. 5 mos. Susannah d. April 16, 1865 Æ 76 yrs. William J. AUSTIN d. Dec. 13, 1891 Æ 77 yrs. Eliza Jane died May 4, 1829 Æ 1 yr.
Bradford d. April 30, 1843 Æ 8 yrs. Hubbard d. May 3, 1843 Æ 5 yrs. Cutler (Sutter?) d. May 5, 1843 Æ 2 yrs. Jane dau. of Wm. & Mary B. BRONSON d. Jan. 22, 1855 6 yrs. 3 mos. 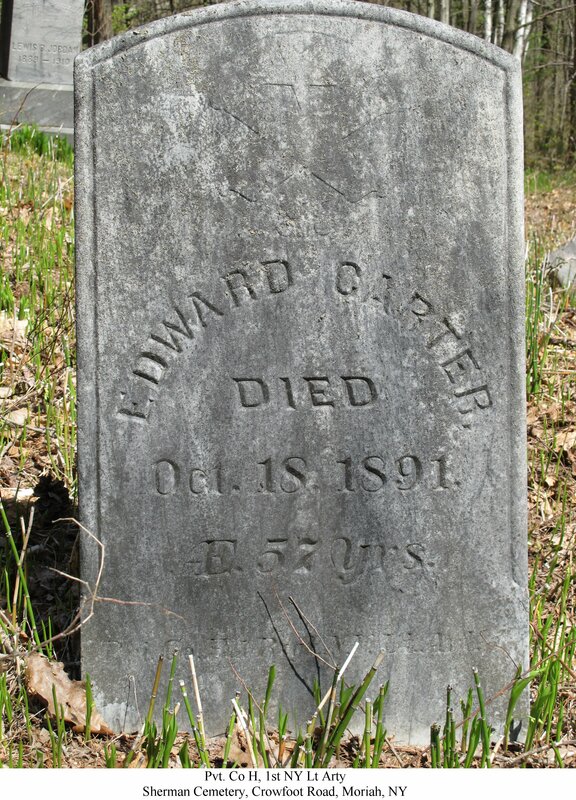 Edward CARTER Died Oct. 18, 1891 Æ 57 Pvt. Co. H, 1st Reg. NYS Lt. Art. John d. July 5, 1832 Æ 32 yrs. 4 mos. Isabel, dau. of Alpheus & Nancy CHAPMAN Apr. 9, 1884 Æ 13 yrs. 22 ds. Enos, son of O. & E. M. FISH d. Mar. 24, 1887 Æ 16 yrs. 6 mos. 22 ds. Linnie, dau. of O. & E. M. FISH d. Mar. 23, 1887 Æ 2 yrs. 4 mos. 7 ds. 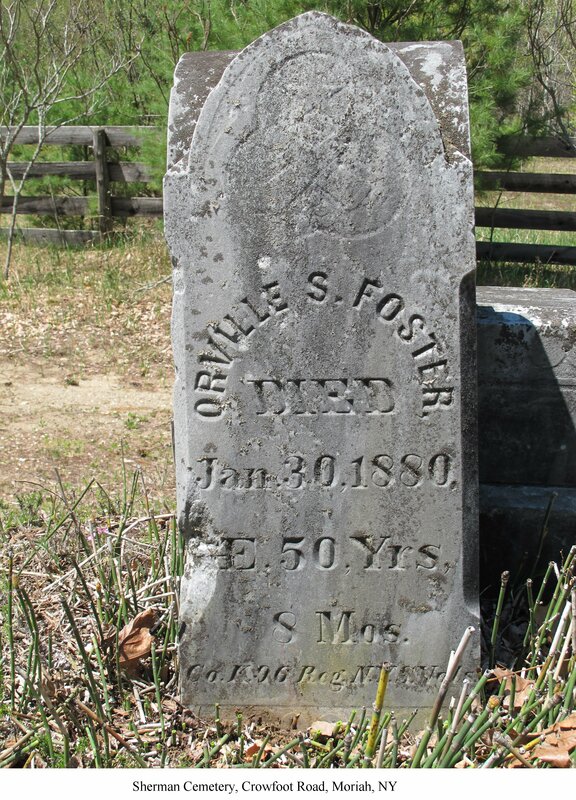 Orville S. died Jan. 30, 1880 Æ 50 Yrs. 3 Mos. Co. K, 96 Regt. NYS Vol Inf. 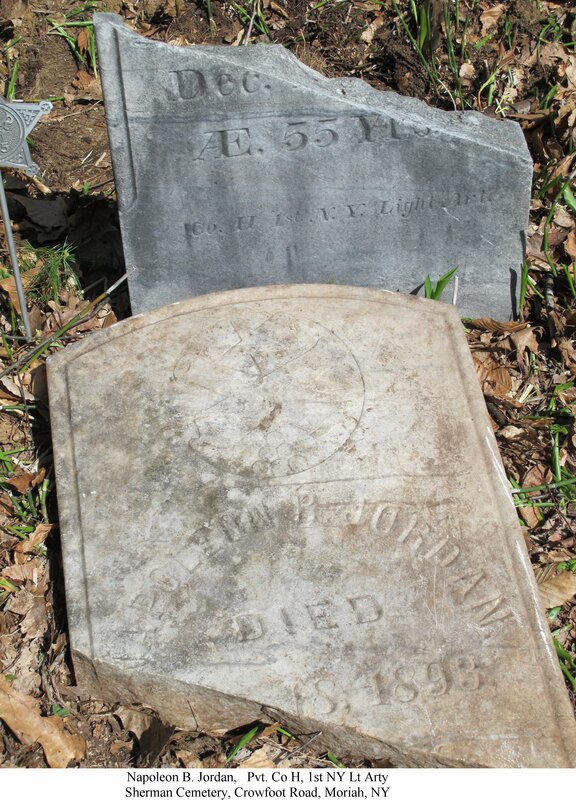 John son of Thomas & Honora GOLDIN drowned May 7, 1853 Æ 18 yrs. 11 mos. Peter son of T. & H. GOLDIN d. Sept. 22, 1848 Æ 5 yrs. 6 mos. Mary, wife of Benj. JORDAN May 1, 1857 Æ 85 yrs. 8 mos. Napoleon JORDAN d. Dec. 18, 1893 Æ 56 Co. H. 1st N.Y. Lt. Art. Elmer son of N. B. & M. E. JORDAN Dec. 25, 1864 Æ 5 yrs. 9 mos. Eliza JONES d. May 4, 1829 Æ 1? yrs. Charles, son of Charles & Caroline LOVELESS, died Aug. 13, 1850 Æ 2 yrs. 2 mos. 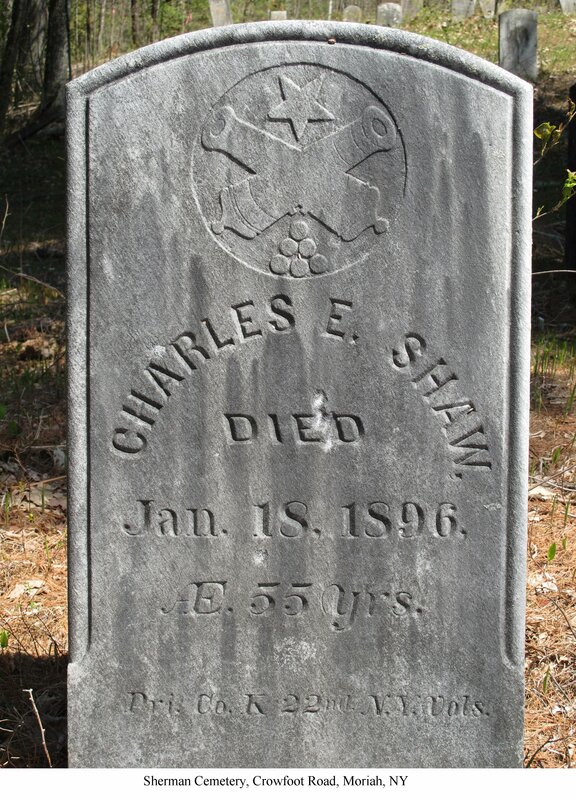 Charles, son of Charles & Caroline LOVELESS, died Aug. 13, 1850 Æ 17 yrs. 2 mos. 11 ds. Gordon, son of Wm. & Flora MESSENGER Nov. 18, 1901 Æ 8 mos. Phebe Wife of Thomas ORMSBEE d. Jan. 25, 1861 Æ 71 yrs. 4 mos. Densy, Wife of Richard SHAW Oct. 29, 1853 Æ 33 yrs. 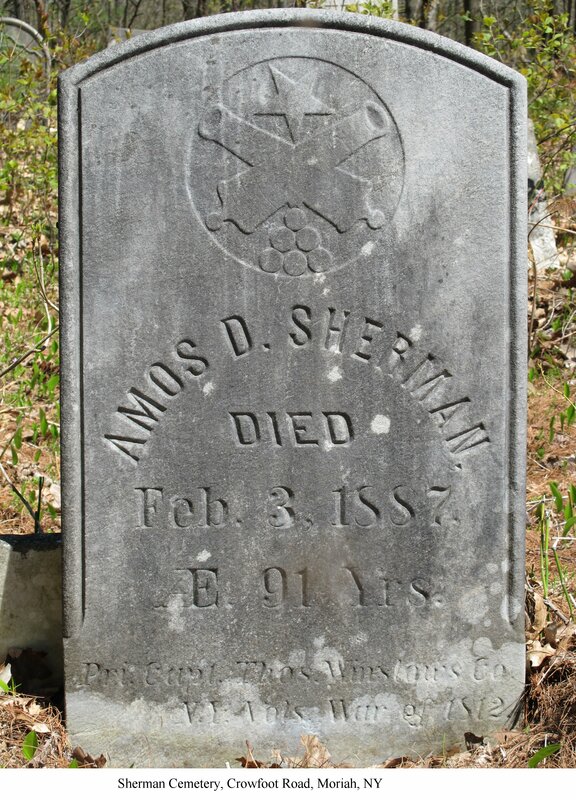 Harmon, Son of R. & D. SHAW July 27, 1864 Æ 20 yrs. 4 mos. Charles E. died Jan. 18, 1896 Æ 55 yrs. Pvt. Co. K 22nd NY Vol. Inf. George E. July 21, 1874 10 yrs. 6 mos. Orlando July 14, 1875 6 yrs. 7 mos. 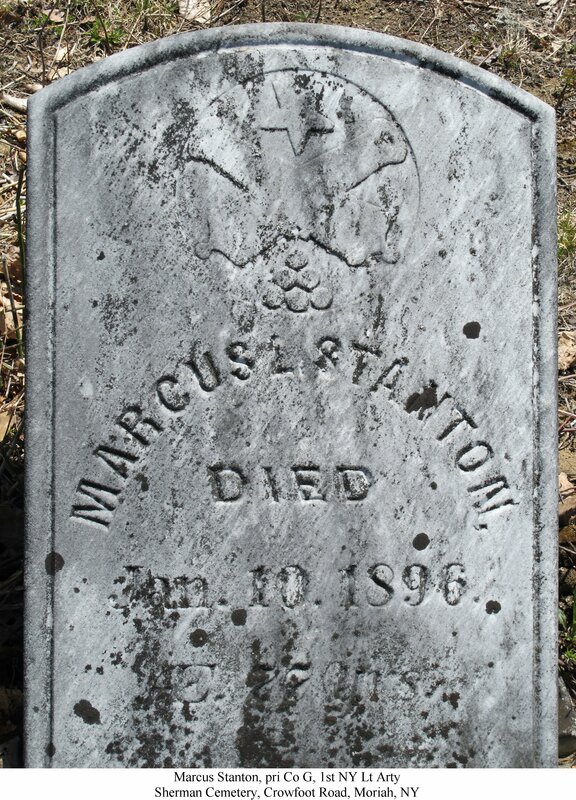 Marcus L. d. Jan. 10, 1896 Æ 77 yrs. Co. G. 1st NY Lt. Art. Asel, Son of Richard F. & Joanna TRAIN, d. 184? Lucis H., Son of R. F. & J. TRAIN d. May 26, 1844 Æ 1 yr. 8 mos. Sarah A., Dau. of Thomas & Betsey TRAIN d. Sept. 10, 1851 Æ 4 yrs. 11 mos. 10 ds. Isabel F. (Isahel?? ), son of B. TRAIN Apr. 27, 1830 Æ 3 wks. 3 ds. Rachel Ann, Dau. of T & B. TRAIN Aug. 9, 1831 Æ 2 yrs. 3 mos. 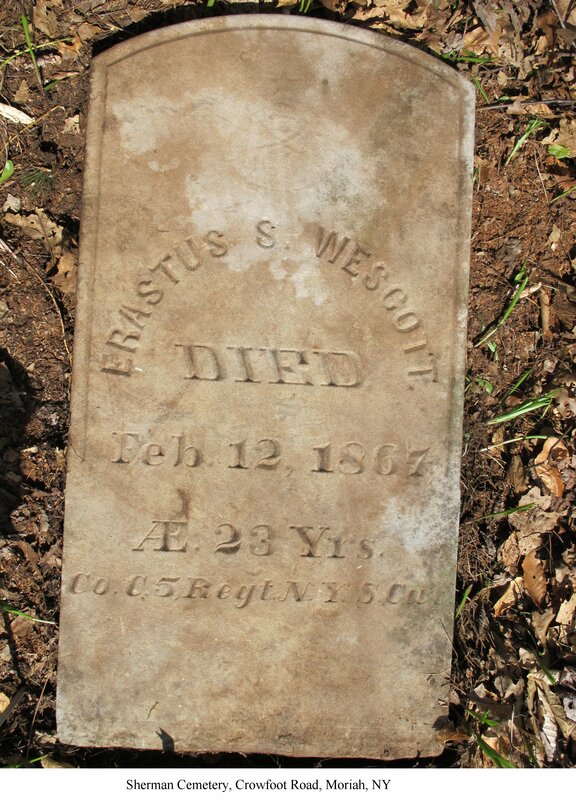 Erastus S. WESTCOTT died Feb. 12, 1867 Æ 23 Co. C 5th Reg. NYS Cav.